About a year ago. I made some fresh crackers that Jan named “Karl Don’t Make These Crackers.” This was not because they were so bad, but because they were so good. These crackers were just too tasty and addicting to just leave laying around tempting you to eat them. Because of this, I have really made these crackers only a few times in the past year. Once you eat a fresh cracker you will wonder why you ever eat the things out of a box. Eilene’s friend invited her to go to Disney land this weekend. Originally her father was going to take them and then he wasn’t. Then the girls decided they were going to go on their own. As they both have just turned 18, we were not comfortable with this. Jan has ended up offering to drive them on the four day trip. While the girl’s are in Disneyland, Jan will sit in the hotel room reading five inch thick pile of research papers and knitting a Whovian scarf (4th Doctor). To keep her company I decided to try to make my sinful crackers even better. When I told her about my plan she begged me not to make them, because she would simply eat them all and she is working hard on her diet. When she arrived, starving after almost 9 hours of driving (a fire on I 5 and LA traffic almost doubling the trip), she regretted that decision. I decided that adding some toasted sesame seeds might be a good addition. I worried the original cream might not be a strong enough binder to keep the crackers from falling apart with the added seeds. Last week, I made lembas bread that included egg as its main liquid ingredient. I decided that if I replaced some of the cream with an egg it would keep the crackers together. The original recipe was very dry and dense. It was difficult to roll them out thinner than a quarter of an inch thick. This produced a thick, buttery hard-tack like cracker. I decided that if I make the dough just a bit wetter I could roll them thinner and make these crackers more saltine-like. Note: My original recipe made a lot of crackers and I am home alone, since I am not suicidal, I am cutting the recipe in half. [Once you start eating these you really cannot stop until they are gone and then the urge to make more is almost over powering—if you have any will power issues I can only recommend you do not go down this path.] The original proportions are in () in the ingredients list. 1. Put 2 cups of flour, the salt, baking powder, and sugar into a large bowl and mix well. Tip: I run the dry mixture through a flour sifter a couple of times to get a thorough mixing. I would use Kosher salt, but the crystals are too large to go through my sifter. 2. Toast the sesame seeds and chill then to them cool completely. Tip: Put the seeds in a small dry skillet and toast them on medium high, stirring constantly, for 5-8 minutes. remove from the hot pan as soon as they are well fragrant, but not burned. If they burn, toss them and try again. 3. Slice the cold butter into thin pats and drop them into the flour. Stir occasionally so the pats are covered in flour and do not stick together. Use a pastry cutter to break the butter into small pieces. Tip: The trick here is to cut the butter into small pieces without causing it to start to melt. Do not over work the butter. 4. Stir in the cold sesame seeds. 5. Put the flour/butter mixture into a seal-able gallon bag. Press as much air out as you can and seal it. Put the bag in the refrigerator for 15 minutes. 6. Using a rolling pin, roll out the dry flour and butter. Mix up the bags contents and continue to roll it out until the butter pieces are small flakes. If you think the butter may be getting warm, return the bag to the refrigerator for 15 minutes before continuing. 7. Put the flour mixture back in the bowl and make a well. Tip: Scrape any butter free that has stuck to the inside of the bag and add it to the bowl, ten minutes in the freezer makes this easier to do. Do not discard the bag. 8. Put the egg in a measuring cup and lightly beat it. 9. Add cold cream to make ¾ of a cup. Beat the eggs and cream together. 10. Pour most of the cream mixture into the well and stir briefly until most of the flour has been moistened. Reserve 1/8 of a cup to brush on the tops of the crackers. Tip: A little dry flour is OK, but add another teaspoon of cream if there is a lot of dry flour in the bottom of the bowl. 11. Turn out the dough onto a board (a pastry marble if possible) and flatten dough into a rough rectangle (wider than tall). Scrape up any dry flour or dough bits and spread it over the dough. Fold the left and right edges of the rectangle into the middle and gently stretch and press the dough. 12. Rotate the dough 90 degrees and press out into a rectangle again. Tip: The point is to make sure the flour is fully moistened and the butter is spread out inside the dough without creating too much gluten, which will make the crackers tough. 13. Roll out the rectangle into a 3/8 inch sheet. Fold the left and right edges of the rectangle into the middle and then roll the long rectangle of dough into a pin-wheel. Tip: Be careful not to overwork the dough and melt the butter bits. Any melted butter will be absorbed by the flour making it gummy. Cold bits of solid butter will melt while baking and form steam and flakey pockets inside the cracker. 14. Press the rolled up dough back into a 1 inch thick rectangle. Put it back into the plastic bag and chill the dough for at least 30 minutes. 15. Move the oven rack to the top position and pre-heat the oven to 400° F.
16. Roll out the dough on a lightly floured surface to 3/8” thick rectangle (it should still fit in the plastic bag, if not push it together slightly). Put the dough rectangle back in the bag and let it rest in the refrigerator for 10 minutes. Tip: When you roll out dough, the gluten has the tendency to tighten up and try to snap back to its original shape. Resting give it the opportunity to relax and adjust to its new shape, allowing you to stretch it further when you start rolling it out again. 17. Lay a sheet of parchment paper on your board that is close to the size of your baking sheet. 18. Place the dough in the center of the parchment and starting from the middle of the rectangle of dough roll it out to at least 1/8 of an inch thick (the thinner the better). 19. Use a rolling dough cutter to cut the sheet into individual crackers. 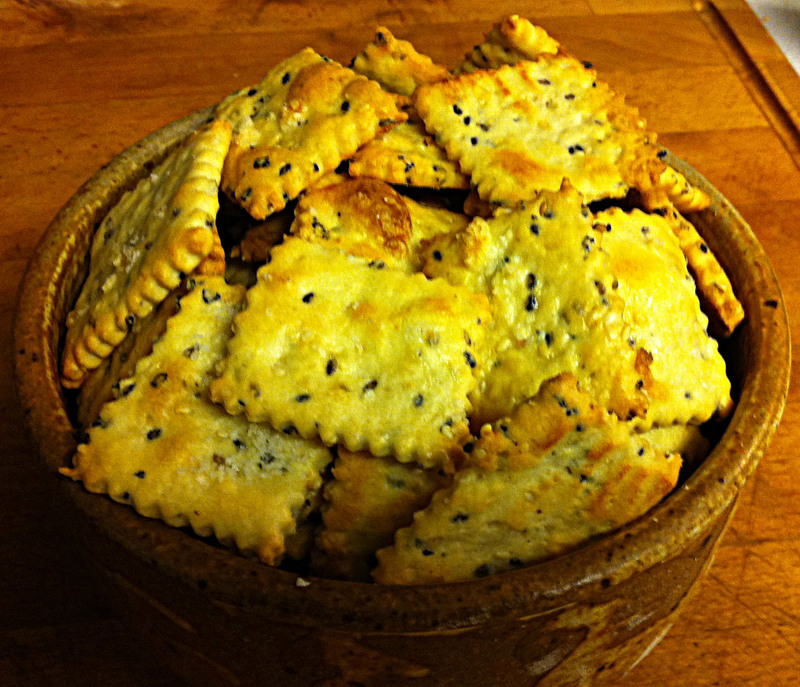 A Note on Shape: I have a jagged edged pastry wheel which gives the crackers a decorative edge. You could also use a sharp knife or rolling pizza cutter to give your crackers a straight edge. You can cut the dough sheet into squares, rectangles or diamonds. If you would like round crackers, use the 2” lid of a Kerr jar (or similar open jar lid) to cut out rounds. Gather and reroll any dough straps and repeat until the dough is used up. 20. Without separating the crackers, slide the parchment paper on to the baking sheet. 21. Brush the tops of the crackers with the remaining cream mixture and, if you desire, sprinkle each cracker with a few grains of Flor de Sal or Kosher salt. 22. Bake crackers until they are starting to have some golden brown spots, about 15 minutes (18-20 minutes more for thick crackers). Tip: Do not over bake. If the edges start to get dark brown they will taste burnt. 23. When done remove the crackers to a wire rack and let them cool. Note: The first few hours the crackers will be a bit soft and chewy. By the second day they will dry out completely and be crisp and crunchy. If they last three days, which they rarely do, store them in an airtight container at room temperature.